On our recent trip to Italy, I probably had caprese almost a dozen times. My favorite was in a little Tuscan town, Montalcino, at Grappolo Blu for lunch one day. It was perfect! I knew I needed to start eating caprese at home. It’s so simple and easy to make, yet so delicious. It’s a salad usually made with buffalo mozzarella, plum tomatoes and basil. I was watching TV the other day and they were demonstrating a recipe for pasta caprese and I knew I had to try it. I expected to like it, but what I hadn’t expected was how much my family loved it. The flavors are so fresh and the summer tomatoes were still fabulous. It’s definitely one I’ll make again and again. Whisk oil, 2 teaspoons lemon juice, garlic, shallot, 1/2 teaspoon salt,and 1/4 teaspoon pepper together in large bowl. Add tomatoes and gentlytoss to combine; set aside. Do not marinate tomatoes for longer than 45minutes. While tomatoes are marinating, place mozzarella on plate and freeze until slightly firm, about 10 minutes. Bring 4 quarts water to rolling boil in stockpot. Add 1 tablespoon salt and pasta, stir to separate, and cook until al dente. Drain well. Add pasta and mozzarellato tomato mixture and gently toss to combine. Let stand 5 minutes. Stir in basil; adjust seasonings with salt, pepper, and additional lemon juice or sugar, if desired, and serve immediately. Note: This dish will be very warm, not hot. The success of this recipe depends on high-quality ingredients, including ripe, in-season tomatoes and a fruity olive oil. Don’t skip the step of freezing the mozzarella, as freezing prevents it from turning chewy when it comes in contact with the hot pasta. If handmade buffalo- or cows-milk mozzarella is available (its commonly found in gourmet and cheese shops packed in water), we highly recommend using it, but skip the step of freezing and add it to the tomatoes while marinating. Additional lemon juice or up to 1 teaspoon sugar can be added at the end to taste, depending on the ripeness of the tomatoes. Nothing like the classics to make meal time easy and delicious! That looks delicious…that’s my favorite Italian dish-I’ll have to give your recipe a try. Thanks for the great comments. I should have mentioned that my husband and I went to Italy for our 30th wedding anniversary! I definitely am a lucky girl! Oooh, lucky you getting to go to Italy! I love caprese too, although I didn’t know what it was called. Beautiful, simple and delicious! Love it! this pasta looks really good…italy really sounds like a fun place! So simple and so fresh! This is like a summer day in a dish. Simple ingredients make the best meals. This pasta dish looks amazing. I went to Italy a couple of years ago and fell in love. I need to get back there again. The pasta looks perfect! Sounds and looks delicious Barbara! My mouth is watering looking at this picture. This looks so good! I will definitely file this one until we can get some good, ripe tomatoes. YUM! 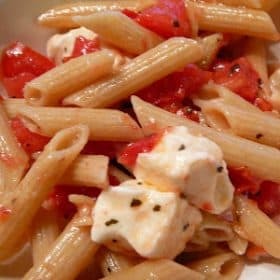 I love this pasta salad and make it for many summer barbecues. Oh how I loooove caprese! I would love this pasta too! Doesn’t get any better than tomatoes, mozz and basil! Looks delish! This looks wonderful and yet so simply. I’ve heard the best Italian food is simple but using the best ingredients! This looks wonderful. I will have to give it a try. How great the you got to go to Italy!